If you have an online retail store and would like to exchange links with us please email us . Give us the URL of your site along with the title and description you'd like us to post. Also, please give us the URL of the page where our reciprocal link is posted. For our banner and text links please see below. gaming and/or casino, printer ink cartridge, pornographic, unsolicited credit card, credit report, banking and/or mortgage promotion, tobacco and/or alcohol related, prescription and/or enhancement drugs, web cams, email spam promoters, firearms and/or weapons related, attorney and/or lawsuit promotion, dating, personals & love connection sites, and "link farms". We reserve the right to decide if your site is acceptable for a reciprocal link. Due to the high volume of link exchange requests that we receive our decision will be final and we will not negotiate nor send an email with an explanation if the site submitted to us is deemed unacceptable. 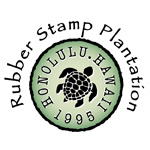 If you would like to share Rubber Stamp Plantation's unique Hawaiian gifts with others, please let us know. We are happy to link up to fellow Hawaiian gift specialists so just contact us. We have offered two size choices for you, and we ask that you do use one banner along with our description and a link to our homepage. In order to take banner from our site, please right-click and "Save Image As". Description: "Rubber Stamp Plantation your source for Hawaiian stamps, stickers, decals, stencils, license plate frames and temporary tattoos with the Hawaiian flair."